RideReady is also available for Airplanes, Seaplanes, Hot Air Balloons, and Gliders as well. You've come to the right place! Our RideReady software is the best way for you to prepare and be ready for your helicopter checkride. Whether it's your initial private pilot helicopter or an advanced rating or certificate, RideReady has thousands of questions written by professional pilots, instructors, and examiners that will get you up to speed in the necessary knowledge areas of your checkride. "NAILED the check ride! I Used your RideReady software and did GREAT. The examiner said I actually performed to commercial standards - Thanks for the great software!" RideReady has hundreds upon hundreds of sample oral exam questions. Our questions are drawn from actual pilot checkride de-briefings and examiner interviews as well as from FAA and other source material. We work to constantly update the software to keep it up to date as we get post-checkride reports from pilots like you and as FAA rules change. 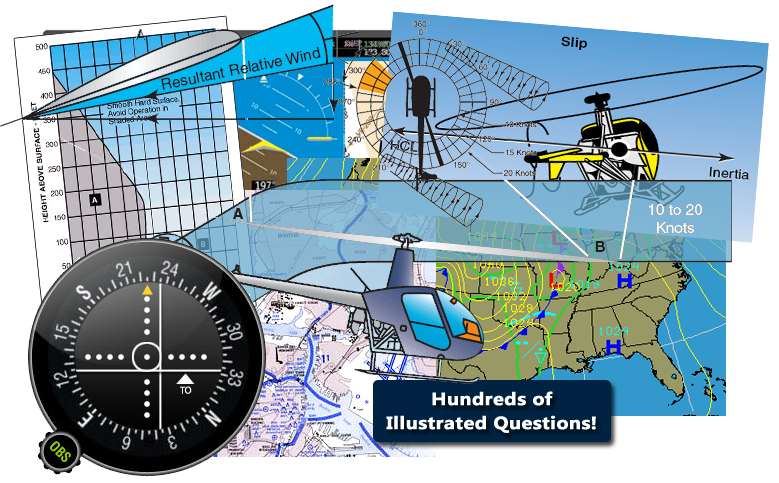 RideReady features information specific to various helicopters (R22, R44, S300 CB and CBi, S300C), and allows you to further customize the questions and answers based on whether your aircraft has a clockwise or counterclockwise main rotor system. RideReady is easy and convenient to use. It features timesaving features such as the ability search questions and tag questions as easy or difficult to focus and streamline your study. ... but don't take our word for it! You can download the demo of RideReady (PC version) FREE and decide whether it's right for you before you buy it. What specific aircraft does RideReady: Helicopter provide information for? RideReady is a useful tool regardless of whether you fly one of the below helicopters or not. Each RideReady Helicopter version contains hundreds of questions that are pertinent for FAA checkrides regardless of what aircraft you fly. However, one of the places that RideReady shines is in that it also contains questions that are specialized for particular aircraft. This is particularly important since, as you know, systems and performance questions are stressed on every checkride. Additionally, the sofware has an option where you can specify whether your helicopter has a clockwise or counterclockwise main rotor system. Based on your selection, the software will modify its questions to match your particular situation. Please note that while helicopter specific questions are featured in the Private/Commercial and CFI versions of RideReady, they do not appear in the IFR version, where the emphasis is more on IFR procedures and information related to IFR flight in all helicopters. Why are Private Pilot and Commercial Pilot Helicopter one unified product? There are relatively few differences between a Private Pilot Helicopter checkride and a Commercial Pilot Helicopter checkride from an oral exam point of view (of course the checkrides themselves differ in the tolerances expected for the maneuvers, the maneuvers themselves to some degree, the experience requirements to take the checkride, and so forth). Furthermore, for many people (typically already rated in airplanes, for example), a commercial helicopter certificate may be their first in helicopters. In the "Test Options" screen, you can select whether you are studying for the private pilot or commercial pilot checkride and RideReady will make the necessary modifications. (Please note that in the general spirit of RideReady, some 'advanced' questions may appear in the Private Pilot test version, though such questions will typically not be marked as 'crucial.') In short, you get one program for one price that will prep you for either or both checkrides. This is a question that we are often asked relating to our airplane products. For helicopters, there are few, if any, helicopter specific oral exam preps out there other than maybe some put together for quite local usage by some local flight school. At any rate, there are certainly no preps (either in airplane or helicopter) that we know of that come anywhere near the depth of content and number of questions that RideReady has. This is the work of dozens of authors with decades if not centuries of flying and instructing experience among them. That said, please don't take our words at face value - please download the demo and try it out for yourself and see! Note that RideReady contains an option that lets you study only those questions which our authors have determined are "most critical." This allows you to focus your study if your time is limited. You can download the demo version for free and try it out. To get full access to RideReady, you need to unlock (buy) it. When you buy it, an unlock code is emailed to you that you then enter into the software which transforms it into the full version. For a complete list of prices, please see the RideReady order page or click below. This one product will help you get ready for both the Private Pilot Helicopter and Commercial Pilot Helicopter Practical Tests (Checkrides). Includes preparation for "Fundamentals of Instruction" portions of the CFI checkride oral as well as hundreds helicopter-specific questions. For the serious and dedicated helicopter pilot of the future! All three of the above RideReady Helicopter titles at a special bundle price. If you plan on taking your ATP helicopter checkride, our software can be of tremendous help. Since an ATP checkride oral typically consists of both instrument and VFR questions, more likely than not both the Private/Commercial and IFR versions have hundreds of questions each that can apply to an ATP Helicopter checkride. However, the software has few or no questions specific to Turbine or Part 135 operations, so if you are taking your ATP checkride in a Turbine helicopter or in a Part 135 environment, you will need to supplement your study with a review of turbine operations, your aircraft POH, and the relevant Part 135 FARs. If you are taking your ATP checkride in a regular Part 61 environment using a piston helicopter, then our software should be the bulk of what you need for your review. What about INSTRUMENT Flight Instructor - Helicopter? To prepare for your CFI-I Helicopter checkride, you should know the content of RideReady: IFR Helicopter very well and you should also study the "theory of learning" sections of the RideReady: Flight Instructor (CFI) Helicopter. The CFI-I test is a mix of the two, in that sense. Each test bank covered by RideReady includes hundreds upon hundreds of questions. The exact number that you will see depends on the aircraft, specific test, and other configuration options that you have selected. Certainly, each RideReady test bank has many more questions than oral exam prep books do, and more questions still are being added as feedback comes in and FAA rules change.